This bag is one of the prettiest things I own. 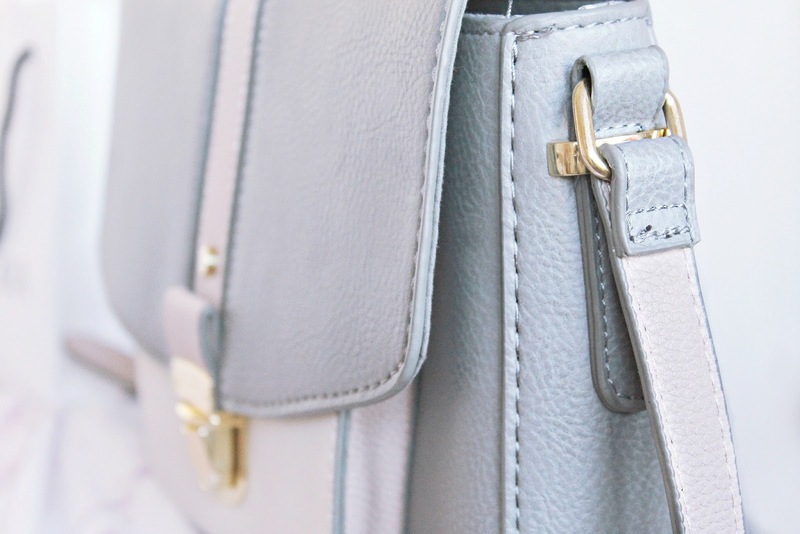 I always go to Accessorize for bags, purses, they always get it right. I had no idea that Mitch went there too (maybe he saw my Christmas gift guide!) I love the blush pink and mink grey hues, with gold detailing. 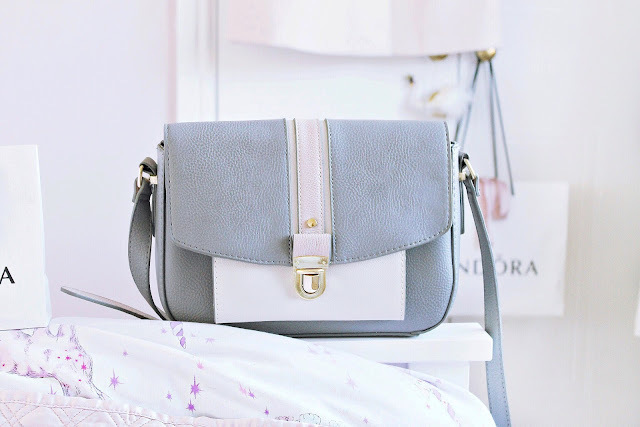 The strap is just the right size and this is a slightly smaller size than my other one, meaning I have to actually gasp sort my bag out and stop hoarding things around in it. Mitch's family gifted me this adorable blush pink hat! 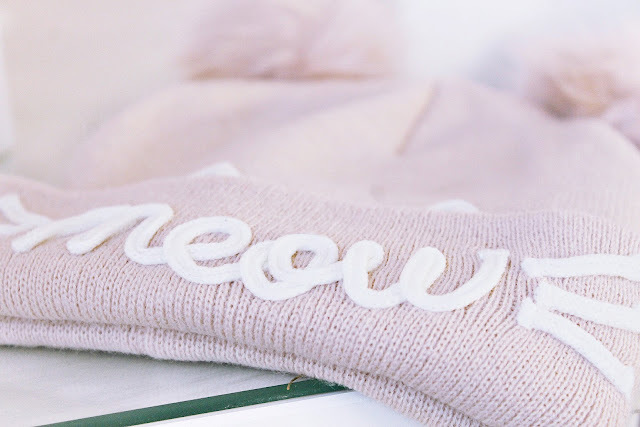 It has fluffy pompom ears and white piping spelling 'meow' with ears and whiskers, I'm in love. I can't believe how well they know me, it's so practical too. I was in no way expecting to receive a Pandora charm this year as we have been struggling to cover Christmas and didn't have anything left over, but somehow Mitch managed to find me this beautiful Disney Belle charm, it's so precious! It's a drop down charm of Belle's yellow gold ball gown and I can't stop looking at it. It's so intricate, I love all of the little silver sparkles on the dress and 'Belle' is inscribed on the ring of the charm. 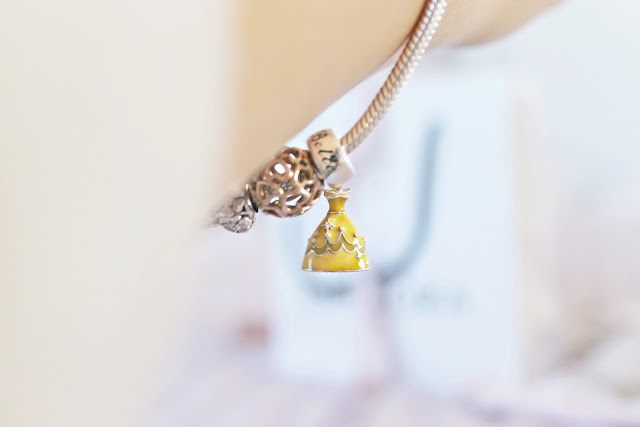 Belle is one of my favourite Disney princesses and I love anything miniature sized too, this is perfect! The pink coat of dreams from my Christmas gift guide! I had given up on getting this coat after not being able to justify buying it myself but little did I know it would be waiting under the tree for me when we got back home for Christmas. It's the most wonderful thing, from the faux fur collar to the poofy sleeves. It's of the prettiest milky pink shade. 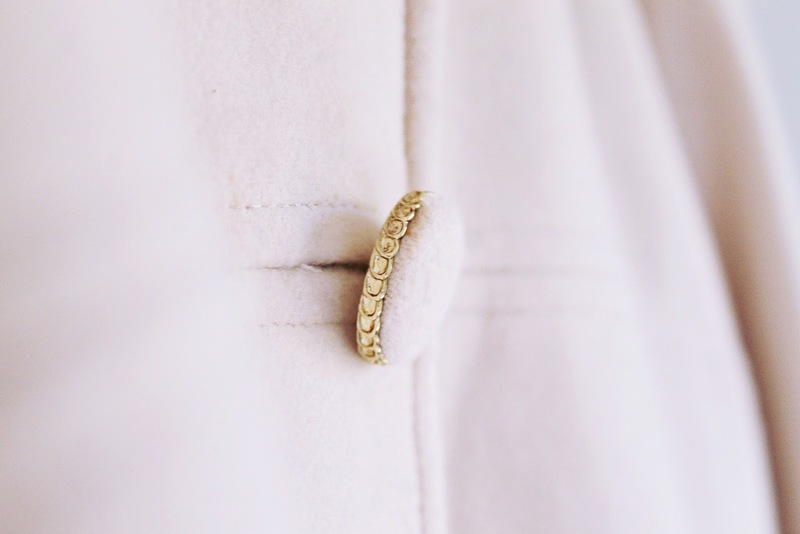 Even the buttons are beautiful, with gold detailing! 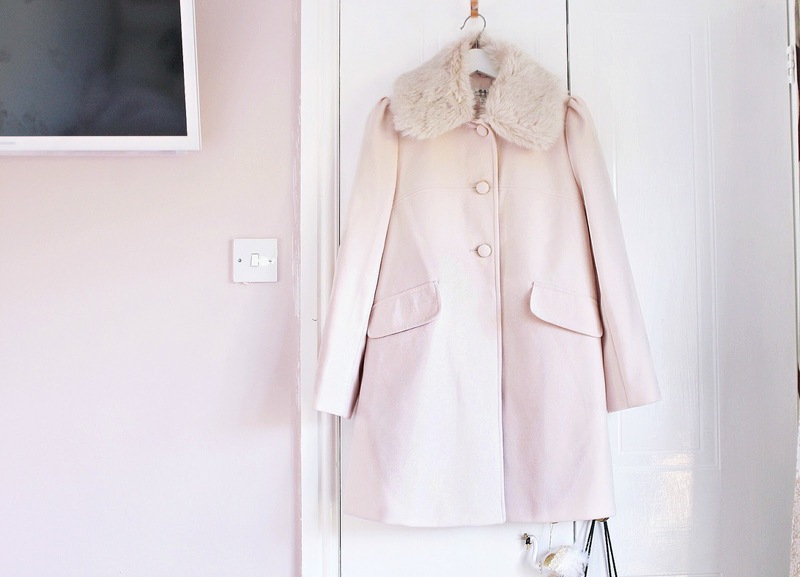 It's incredibly cosy too, I couldn't have wished for a more perfect winter coat. I'm excited to wear my favourite colour all winter long! I've been struggling with a really intense fatigue spell since we got back so it gives me a little lift every time I see it - and motivates me to rest and care for myself, a reassurance that soon I can go out and wear it! I was gifted this Victoria's Secret spray by Mitch's family, it looks and smells beautiful! I much prefer the old Victoria's Secret bottles as they look so pretty on your dressing table, with the bow, gold script and streamlined shape. The scent reminds me a little of Pure Seduction but is softer, more delicate and dreamy. I received lots of Soap and Glory goodies from Mitch's family, I can't wait to delve in to these! I spent many an afternoon gazing at the beautiful gift displays in Boots, I feel overjoyed to have my own little piece of them. 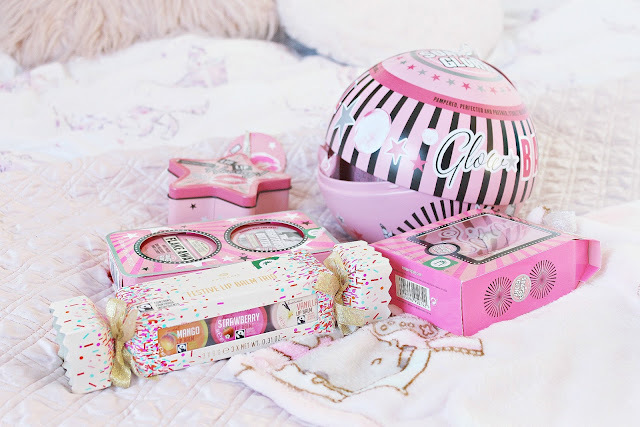 This is such a gorgeous collection of gifts, and definitely shows that you have a family who know you really well - they’ve picked so perfectly! Hope you enjoy wearing all these goodies. That coat in particular is giving me such envy, it’s a beautiful shade and I think I’m going to need to go out and see if I can’t find myself one! That jacket is gorgeous! All of the gifts you got are so usable and definitely thought well :) Your family knows you really well! These are lovely gifts! The bag is gorgeous, I love these shades and it will look great this spring :) Also, the Belle charm is adorable, what a thoughtful gift. Have a wonderful new year Elizabeth! The color of the coat is absolutely beautiful! I'm 100% sure it would look lovely with the bag. The palette of colors within your gifts is perfect! Your blog is also sooooo pretty! I love pastel pink. That Pandora charm is so cute. Love the bag aswell.